Dumbing down the governor’s election David Vitter and Duck Dynasty style; will Jindal divorce the Robertsons? Lying, Spying, extorting the U.S. Army Corps of Engineers in exchange for campaign contributions (see story below), frequenting prostitutes, suborning perjury, blurring the lines between campaign and Super PAC…. It’s all there and just when you think the David Vitter campaign can’t get any weirder, it does. It always does. Just when you think nothing else can happen with Vitter’s campaign to make you roll your eyes and mutter, “OMG,” something does. It always does. Simply put, the Vitter campaign is like a recurring bad dream; it just won’t go away. It won’t. It just won’t. It never does. And now we’re treated to one of the most bizarre events of the campaign, one that conjures up images of that laughable online video of Bobby Jindal breaking the news of his presidential quest to his children or which Bob Mann is reminded of: that photo of Massachusetts Gov. 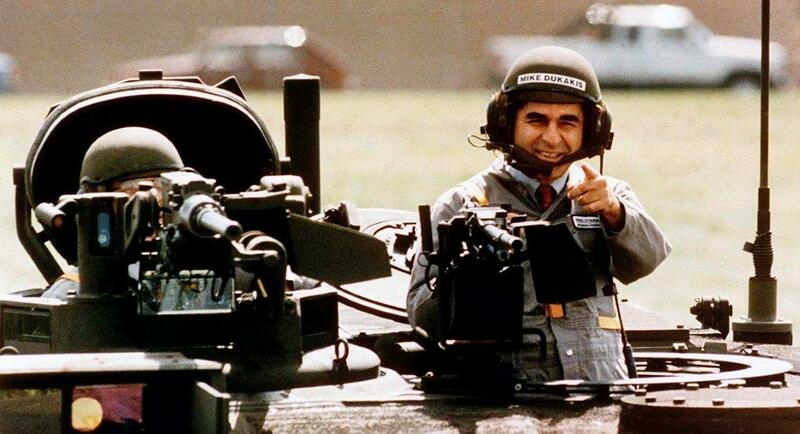 Michael Dukakis posing in the Abrams tank during his ill-fated 1988 presidential campaign against eventual winner George Bush the First. Even though David Vitter is so easy to loathe, this 30-second video should make you cringe in pained embarrassment or break up in hysterics—perhaps both…at the same time. Willie Robertson of Duck Dynasty fame has endorsed Vitter, putting Robertson right up there with the Louisiana Association of Business and Industry and Vitter right down there with Dukakis. One mistake that Robertson and Vitter apparently overlooked was Robertson’s unconvincing claim that they had been “out in the woods.” Why, one must ask after viewing the video, would Vitter wear a freshly pressed cammo shirt, Docker slacks and a dress belt? Perhaps he wanted to cause the ducks to laugh themselves to death. And if you watch Vitter closely at the 10-second point of the video, you will notice his head wobbling up and down like a bobble head doll. Considering he’s in the company of a member of the Duck Dynasty, it’s interesting that he looks less like a duck than the turkey that he is. Not only was the 30-second spot humiliating, but it also raises a burning question: now that the Duckers have embraced Vitter, will Jindal, long the darling of the Duck Commanders, now seek a divorce? Jindal, after all, hates Vitter who has to be considered the political equivalent of “the other woman” in Jindal’s eyes—which, all things considered, makes this infidelity metaphor drip with irony. Eight days to go, folks. Any predictions on what new voyeuristic surprises may be in store for us between now and election day? Throw in the towel John Bel. The party’s over. Willie has spoken. Vitter’s his man. Of course so was Vance McAllister the “Kissing Congressman.” And lest we forget, Willie just loves Jindal. And now “Diaper Dave” is Willie’s man (if you can bring yourself to call him that). Seems to me that Willie is trying to grease the skids for when he gets caught committing marriage infidelity. On second thought John Bel, plan a bigger Victory Party than before this endorsement by Willie. And, what, exactly, were they doing in the woods? Inquiring minds want to know. Dave Treen was the first republican governor in Louisiana since Reconstruction. His integrity was surpassed by no one in politicsat that time. Honest to a fault. Hell, he even brought his lunches to the Capitol in a brown paper bag. Later on he entered the race for Representative Livingston’s seat, after Livingston resigned amid allegations of having an affair. One of his opponents was Vitter. The two had a informal agreement not to run negative campaigns. Shortly after Vitter started his attack dog vicious ads catching Dave Treen off guard. Dave Treen, one of the most, if not the most, sincere honest politicians of out time ended up losing. Duck Dynasty folks know who supplies the bread and the butter(pays 350,000 per show): the state government. We can count on the Republican Party to continue giving the Robertsons a free ride. Only reason they are sucking up to Vitter. The ignorant party strikes again!! OK so the state needs to get up and seek redemption. Really? What did the state do to seek redemption from? I guess redemption from re-electing Bobby would be where we start. Unfortunately I think the only way to do that is to not elect someone like him, e.g. Vitter. You are the master of the understatement du chicot, my friend. Thank you. Yes mon ami I found that so insulting that i could not help it. i suspect though that it represents how he truly feels about the electorate. I get that people make mistakes, the lord knows I have made my share, and it is great that his family has forgiven him but that is still not main reason, i.e. infidelity, I find him unsuitable to lead this state. That ad was indeed painful to watch. It just oozes desperation and will probably be about as successful as the 2nd (?) Edwards=Obama ad that’s been run. C’mon National Repub Guvs Assoc, the voters are smarter than that; they just aren’t buying it. I agree with everything you say. I was poking fun at a sad debacle. In reality it is pathetic. I cast my vote for Edwards on day one of early voting session. @Bob, Sorry, read your comment the wrong way – my apologies. I had been to the dentist too and let’s say I wasn’t in a great mood. Don’t know which is worse; drilling or when they clean and use those little pick things. I hate those. No problems Fredster. I had to visit the dentist last week so I can relate. Hope you’re feeling better. Not all voters are smarter than that…some are voting for Vitter just because he is Republican. They are not looking at the issues Louisiana is facing, nor are they listening to what both men have to say on rectifying these issues. I am not the most political savvy person and I sometimes get confused with some of the stuff. But I like to think that I keep an open mind and choose who is the best person for the job. I must say that I have the most respect for Dardenne setting an example that everyone should take notice. He supported the man he felt would be best for Louisiana, unlike Kennedy. Vitter is shocked Louisiana voters have turned on him after years of being voted into office, regardless of his record or his lack of morals. As a voter who has NEVER voted for Vitter or Jindal, I’m so glad to see both of them losing. Come January, we are rid of Jindal and hopefully next year we can rid ourselves of Vitter as well. If Vitter had made this camo ad before the runoff, he wouldn’t be in the runoff. So proceed, Vitter. Considering what you’ve done to us, it is only right that we watch you and Jindal both self-destruct. When you and he are both out of office, you two will have plenty of time to talk out your differences and even pray together. How obvious is that? Vitter looks very uncomfortable in the Duck people tux. He is pulling out all the stops, but I don’t think it will be enough, at least I hope not. Hopefully, it will be enough to LOSE him some votes.